In the pursuit of your fitness goals, there is no substitute for eating right and training hard. But how do you expect to accomplish either of those when you don’t feel right physically? It’s hard to be fully invested in your nutrition and workouts when you’re feeling bloated, uncomfortable, or dealing with other digestive problems. Probiotic supplements can help alleviate these troubles so that you can leave them in the dust and focus on performing your best! Things like poor diet, certain medications, pollution, and even stomach acid can contribute to an unhealthy gut by breaking down the good bacteria that lives there. An unhealthy gut can get in the way of your fitness goals by negatively impacting your immune system, and making you feel bloated and uncomfortable. But you can fight back with a probiotic supplement! Probiotic supplements work to maintain this tiny society of good bacteria and help to restore a positive balance in your gut. This helps optimize your digestive system which not only reduces tummy trouble, but also bolsters your immune system, and can even help you reach your weight loss goals faster by optimizing your metabolism! But not all probiotic supplements are created equal. There are many strains of good bacteria, and some probiotic supplements only contain one or two of them. Many supplements also stop with just the probiotics, and provide nothing more. Who says a probiotic supplement has to be a one trick pony? You want a product that delivers multiple benefits. A probiotic supplement can help you feel your best, allowing you to optimize your fitness and nutrition so you can more effectively reach your goals! Whether you’re trying to lose weight, build a toned physique, or just maintain your results, a probiotic supplement for women can help you get there. The best probiotic supplement will provide multiple strains of probiotics to help improve overall gut health, as well as prebiotics, which are indigestible fibers to feed and promote the growth of good gut bacteria. Having a healthy gut will help you support your weight loss goals, but a probiotic supplement that includes specific strains that offer additional weight loss advantages, like the L.Gasseri and L. Rhamnosus strains, can offer additional support and help increase your efforts. By balancing out your gut health, you’ll be supporting your immune system, which can help keep you feeling good and healthy. Additionally, studies show the correlation between sleep and optimal gut health. A probiotic supplement that provides ingredients to promote relaxation and a good night’s rest can deliver even greater benefits to your gut. Plus, quality sleep is an essential part of recovery when you’re trying to reach your fitness goals! On the path to achieving your fitness goals, don’t let anything slow you down. Whether you’re trying to burn fat, build lean muscle, or just live a strong and healthy lifestyle, you need to feel your best every single day. Take your health into your own hands with the right probiotic supplement. WHY SHOULD I USE IDEALLEAN NIGHTTIME PROBIOTIC? We usually think of bacteria as something bad, or that causes sickness. But your body actually has billions of “good” bacteria inside it, that give you loads of health benefits. Our modern diet and lifestyle, however, is critically low in these good bacteria. IdealLean Nighttime Probiotic supports and strengthens these good bacteria, or probiotics. 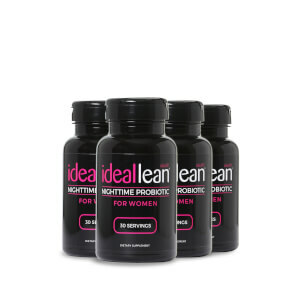 With natural herbs, prebiotic fiber, and 7 different probiotic cultures inside, IdealLean Nighttime Probiotic helps women’s bodies boost immunity and fight infection, absorb nutrients, and aids in digestion and fat loss. IdealLean Nighttime Probiotic helps restore your body’s natural balance. And because Nighttime Probiotic features a natural herb-based, calming Sleep blend, you’ll get all those probiotic benefits while you enjoy a restful night’s sleep. Can I view IdealLean Night Time Probiotic's nutrition facts? Why Do I Need a Probiotic? Our bodies are home to both “good” and “bad” bacteria. Our modern diets and lifestyles, however, can dramatically reduce the ratio of good bacteria, or probiotics, found in our digestive systems. This can result in digestive problems, weight gain, a weakened immune system, and other wellness problems. IdealLean Nighttime Probiotic helps restore the natural balance of bacteria in your body. What Does IdealLean Nighttime Probiotic Do? What Makes Nighttime Probiotic Different From Other Probiotics? IdealLean Nighttime Probiotic is a “symbiotic,” meaning it not only has billions of probiotics inside, but also features prebiotic fiber (fructo-oligosaccharides). This fiber is not digested by the body, but instead feeds the probiotics and helps them grow and work their best. Nighttime Probiotic contains a natural, herb-based Sleep blend to help your mind and body unwind for relaxing sleep, sedative-free. When Should I Take Nighttime Probiotic? Just before bed. Your digestive system is less active at night, so taking IdealLean Probiotic just before bed helps more probiotics make it through your stomach, and begin working immediately. Taking it before bed also allows the Sleep blend to help you relax and sleep peacefully. For Best Results, Can/Should I Take It With Food? Probiotics are not meant to be taken with food, since consuming food raises the acidity of the stomach, potentially destroying the probiotics before they can work. For best results, take before bed, at least 2 hours after eating. The serving size is 3 capsules per day. We currently offer 2 Nighttime Probiotic sizes, 90 and 45 counts. Taken at the recommended serving size (3 capsules daily), the 90-count bottle will last 1 month. Where Should I Store Nighttime Probiotic? We designed Nighttime Probiotic to be shelf-stable, so the probiotics can survive at room temperature. We DO recommend keeping it in a cool place, or even in the refrigerator to extend probiotic effectiveness. How Many CFUs (Colony-Forming Units) Are In This Product? 32 Billion CFU. This is the number of viable or active probiotics in each dosage. These are what is called a “prebiotic.” This is an insoluble fiber that your stomach cannot digest, but IdealLean Nighttime Probiotic and the natural good bacteria in your stomach feed off, of helping them grow and improving your gut health. No problem! Just continue taking it as usual the next night. Will This Make Me Feel Drowsy? Are There Sedatives? Nighttime Probiotic’s Sleep blend is designed to help you relax and calm down. It does this through natural ingredients like the amino acid L-theanine, and herbal extracts of chamomile and valerian root. While ingredients can affect everyone differently, without any strong sedatives, you can safely use Nighttime Probiotic without worrying about a “hangover”-type effect. If I Take It In The Morning, Can I Drive to Work? Yes, these ingredients are designed to relax, not sedate. You may want to try taking it at night first, until you see how it affects you personally. 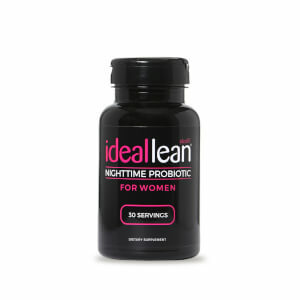 Why is IdealLean Nightime Probiotic for Women? The probiotic strains L. rhamnosus and L. gasseri are linked with vaginal health and comfort. A healthy digestive system reduces bloating. Supports fat loss and a healthy metabolism. Natural ingredients help your body fight inflammation and infection. Aids in absorbing the important nutrients that women need. 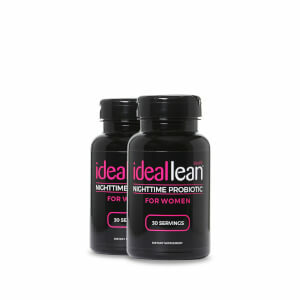 How Will IdealLean Nightime Probiotic Help with Fat Loss? A healthy digestive system promotes a healthy metabolism. These probiotic strains help your body efficiently metabolize nutrients, and burn off an excess of fat. A British study* found that the L. gasseri probiotic strain alone contributed to an average 5-pound fat loss in a clinical study. IdealLean Nighttime Probiotic contains 5 billion CFU of L. gasseri, as well as 6 other beneficial probiotic strains.